The variety of storytelling on display builds such tingly anticipation, each new episode is worth it even when the narrative disappoints. Michael Shannon raps in a Russian accent in the fourth episode of “Room 104” Season 2. There. Now you know it’s coming, and believe me, the Oscar nominee and Chicago bar legend’s skilled rhyming — accompanied by gyrating dancers and a brass marching band — well, it’s worth getting excited about. But anyone who liked an episode or two last year — or finds themselves enticed by the premise, creators, and/or fresh talent — should make a note to fully engage with “Room 104” in Season 2. Even if you’re disappointed, the weekly suspense is electric like few other offerings on television, and the show’s power has only grown since its debut. To say “Room 104” thrives on the unknown is nothing new, but its sustainability, focus, and transportive viewing experience are fresh developments that offer unique value to today’s TV fans. Other episodic series can’t compete with the anticipation that builds prior to and during episodes. Whether you’re waiting to watch one per week or wondering what’s next during a binge, the Duplass brothers’ format frees them from any presumed reality. One episode is a grounded character study; the next is a futuristic horror show. (Believe it or not, Shannon rapping is as real as it gets.) The knowledge that anything can happen often pays off with unexpected twists or affecting straightforward stories, and the variety of storytellers only lends more depth to the adventure. If anything, Season 2 could use a few more voices. 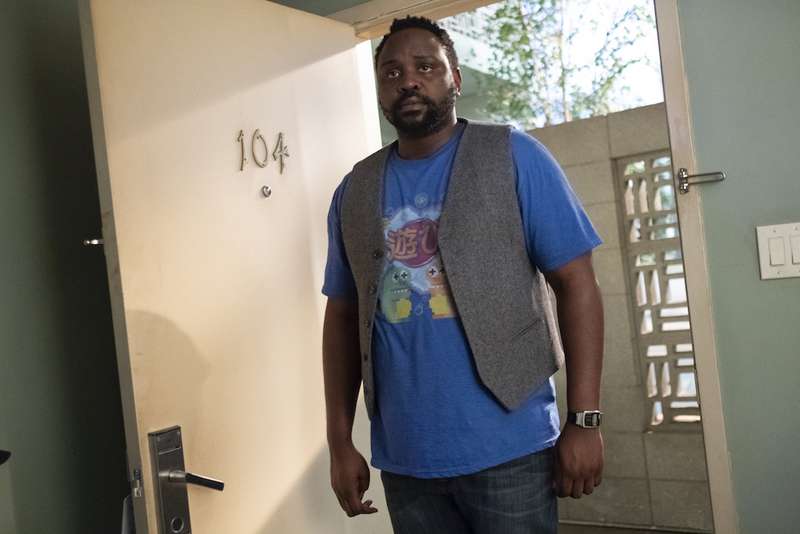 Mark Duplass writes or co-writes nine of the 12 episodes, and though many of his pieces are great — varying in subject matter and utilizing different directors for diverging perspectives — a pattern starts to emerge, and anything regular in “Room 104” is poison. Belief becomes a big motif, with multiple episodes setting up a climax where someone is right and someone is wrong. The reveals can be fun — like “Ralphie,” the Duplass-penned first episode of Season 1 — but the better entries all find more substance elsewhere. They’re surprising for more than their twists, upending expectations by playing off the audience’s lack of prior knowledge. In other words, you may think you know where a story is going, but each creator finds a different way to take you out of your comfort zone. This point means it’s probably best if onlookers enter into each episode knowing nothing about it. If you’re warned this episode may not be as good as the next or told who stars, directs, or writes, then bias comes into play and the intoxicating spell of uncapped imagination is broken. But for those short on time, who watch a lot of TV, or feel uneasy with the unknown, the below list should cover the essentials. These episodes deliver equivalent delights to the thrill of discovering them, but read on at your own risk. Michael Shannon plays a Russian author with a thick accent and crazy rap skills in Liza Johnson’s inventive exploration of faux intimacy. Kent Osborne and Mark Proksch star in a weird, wild episode that’ll have you scouring Google for answers. Brian Tyree Henry is the titular Arnold, who’s trying to remember what happened to him on an unprecedented night of partying the evening prior. Oh, and it’s a musical. A textured turn from Katie Aselton — as a robot trying to convince a reporter she really is a robot — builds to nuanced surprises. “Star Trek: Discovery” star Mary Wiseman leads an exploration of memory and maturity that’s imaginative and sincere enough to be much more than a #MeToo moment. “Room 104” Season 2 premieres Friday, November 9 at 11:30 p.m. ET on HBO.